A visual field test measures how much ‘side’ or peripheral vision you have. It is a straightforward test, painless, and does not involve eye drops. Essentially lights are flashed on and off, and you have to press a button whenever you see the light. Your head is kept still and you have to place your chin on a chin rest. The lights are bright or dim at different stages of the test. Some of the flashes are purely to check you are concentrating. 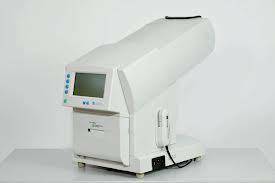 Each eye is tested separately and the entire test takes 15-30 minutes. Our doctors may ask only for a driving license visual field test, which takes 5-10 minutes. If you have just asked for a driving test or the clinic doctor advised you have one, you will be informed of the result by the clinic doctor, soon after it is completed. Normally the test is carried out by a computerized machine, called a Zeiss Humphrey FDT. Occasionally the manual test may be used. For each test you have to look at a central point then press a buzzer each time you see the light.